Dragon fruit, also known as pitaya, is a species of cactaceae which grows in subtropical regions throughout Asia, Central America and South America. It’s an unusual looking fruit which features bright pink, textured skin, and a fleshy edible interior. Dragon fruit has a naturally sweet, delicious flavour which has hints of pear, kiwi, melon and berry. 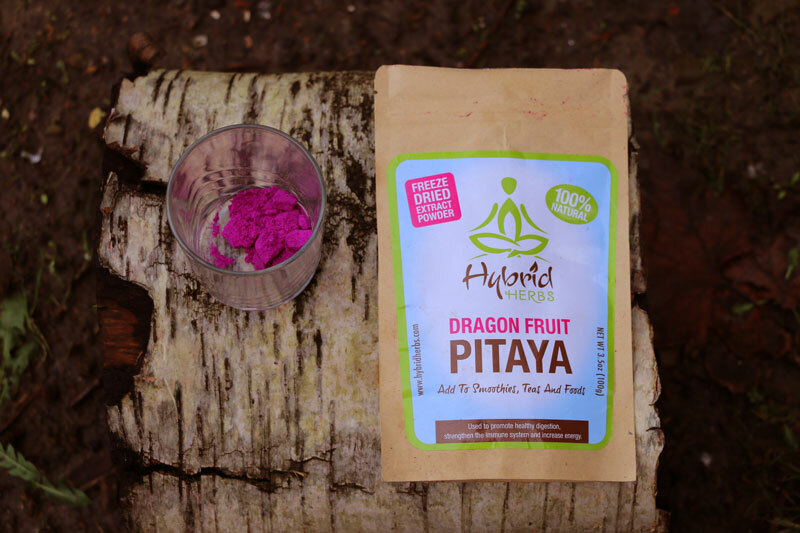 The most common type of dragon fruit has white flesh, however, it’s the magenta-flesh dragon fruit which is used to make this pink superfood powder. What Are the Health Benefits of Dragon Fruit Powder? Dragon fruit is loaded with nutritious compounds including Vitamins C, B1, B2, B3, calcium, iron, phosphorus, magnesium, and Omega 3 essential fatty acids which are stored in the seeds. It’s also low in calories (a whole dragon fruit only contains around 60 calories), so you can pile it into your culinary creations. Dragon fruits are rich in dietary fibre which plays an important role in maintaining the health of the digestive system. The high antioxidant levels in dragon fruit are certainly giving the much-loved acai berry a run for its money. Antioxidants have been scientifically proven to help to rid the body of harmful free radicals and promote overall well-being. Dragon fruit gets its rich magenta colouring from the presence of lycopene, which is a phytochemical and carotene that also has beneficial nutritional properties. Why Choose Hybrid Herbs Dragon Fruit Powder? How Do I Use Dragon Fruit Powder? Dragon fruit powder has so many culinary uses that you could write a whole cookbook on it. Its neon pink colour transform all sorts of sweet treats into nutritious works of art. The powder can be added to smoothies, juices, bowls, desserts, raw chocolates, sauces, dips and ice creams. It also tastes so good by itself that some people eat it straight off the spoon! A general rule is to mix a teaspoon of the powder into your food or drinks, and then increase the serving size if you require a richer flavour or colour. A spoonful of this amazingness takes my smoothie bowls to the next level. Easy, yummy and beautiful! Absolutely beautiful, heavenly colour and taste .Makes breakfast a treat for eyes and mouth!! I couldn't resist this product for its colour. So far it's made my smoothies sing and my porridge hilariously happy. How can any foodie resist? Excellent product - arrived quickly; already using it in my morning smoothies.